Fill out the form or call 1-800-450-5319 for more information about A1 Overseas International and get your FREE, no obligation quote for shipping services to Indonesia! Professional international auto shipping services are the only way to get a vehicle shipped across the waters and into another country. To transport an auto to Indonesia, you will have to be mindful of the requirements. Indonesia Customs can inform you of all that is expected and needed, and able to be transported and not to be transported, in regards to automobiles. A1 Overseas International also allows for the auto shipping process to be easier on their customers with their knowledge and experience of international transport. 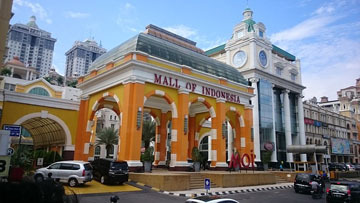 As one of the most populated countries, Indonesia is no stranger to auto import and export. In order to transport a vehicle into the foreign country from the U.S., you will need to prepare accordingly before the auto can even be shipped. Proper documentation will need to be presented and tariffs will need to be paid first. The vehicle must also comply with the Customs regulations. For instance, the vehicle being shipped must be new. Used vehicles are prohibited. Vehicles in Indonesia cannot exceed a 3,000 CC engine size. Most vehicles sold in the country consist of 2 and 4 door sedans, and vans. As a U.S. citizen now residing in Indonesia, purchasing a vehicle there is very difficult. Many financial institutions frown upon giving loans to foreigners. In most cases, it is easier and wiser to have your own vehicle transported through a reputable international transport company such as A1 Overseas International. You will have your own vehicle to travel the country in, considering that those new to Indonesia are usually unable to qualify for auto loans. Public transportation in a foreign country is difficult due to currency and language barriers. Having your own vehicle will prove to be beneficial. Dependable shipping companies offer insurance coverage during the handling, have a variety of services, and are seasoned in international auto transport/intenational car transport. This makes a vehicle’s smooth journey overseas possible. Discuss your transport and get a FREE price quote on boat, motorcycle and car shipping by calling 1-800-450-5319 or fill out the form provided!